In the previous article on Storytelling, we spent time getting into your heroes’ hearts and minds, it’s time to look at your role as mentor. Even though mentors are not supposed to think about themselves, it does help to do that in the context of how we can be useful to the audience. Your role as a mentor is to influence the hero to take action and change things. The mentor’s appearance in the journey is essential to moving the hero past difficult obstacles. Mentors thus have the major responsibility to provide the hero with the necessary guidance, confidence and tools. 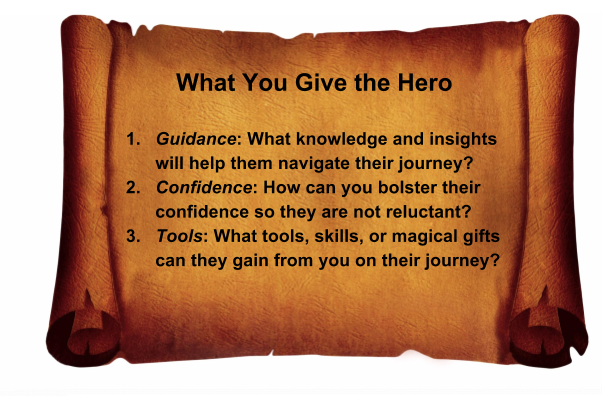 The mentor should provide the hero with important, useful, previously unknown information. You should also motivate the hero when they are fearful or resistant, and give them the tools to adorn their tool belt. These tools could be roadmaps to success, new ideas, or different approaches to solving an existing problem. No matter what the tool is, the audience should leave each seminar knowing something they didn’t know before and with the ability to apply that knowledge to help them succeed. Sharing keen insight and a magical tool or two is great, but if you aren’t credible, your audience won’t listen and your hero will wander off on a random path of chaos. As you present, your audience is sizing you up. It’s human nature for people to compare and validate others against their own criteria and experiences before adopting a new perspective. So how do we create a common ground? Identifying shared experiences and goals is one very good approach to achieving this. You can then build a path of trust so strong that the hero feels safe to cross over to your side and let them guide you on their journey. Focusing on common areas bolsters creativity, so spend time uncovering them. A seminar that creates common ground has the potential to unite a diverse group of people toward a common purpose. People set aside their differences when they are strongly connected to achieving a common goal. An audience chooses whether to connect to you and people will respond only if it is in their best interest. Your audience will feel much more comfortable to follow you in changing their perspective, if this common ground exists. For instance, there might have been a recent policy change and your are presenting it through your seminar. If the general feeling is one of skepticism regarding whether the policy change is for the better, you could reach out to members of your audience with whom you have recently floor judged together and have experienced an exact case where the policy change has worked out perfectly. If, for example, your topic is about investigations, it is a good idea to know some judges in the audience, who have already run investigations and invite them to share their experiences at a certain point during your seminar. Giving them the spotlight, and allowing them to put the topic into a practical perspective, will allow the other judges to break the barrier more easily, especially when dealing with such a challenging topic. Why do you have to go through all these questions about the audience and yourself listed above? Well, because connecting with the audience requires developing an understanding and sensitivity to their feelings and thoughts. When you know someone well, your common experiences create shared meaning. Establishing how you are alike also clarifies how you are different. Once you have identified the precise overlap, you’ll have a clearer understanding of what’s outside the overlap that also needs to be embraced by the audience. Working on this can bring about the shift in perspective we are looking to create within our audience, through delivering a successful presentation. So there you have it; now that the hero and mentor have gotten to know each other well, we are ready to see them setting off on their Journey in the next part of this series!